The ball breaking, anarchist comic book character Tank Girl first appeared in series format between the covers of Deadline Magazine back in 1988. She was originally drawn by Jamie Hewlett (now of Gorillaz fame) and written by Alan C. Martin. Her underground popularity grew and soon she became the ‘face’ of punk rock women. Empowering, gutsy, self-reliant and ballsy, she captured the heart of female generation who felt they’d been underestimated and stereotyped by most of the comic book world. Tank Girl broke the mould and for that reason, she will always hold a little place in my heart. 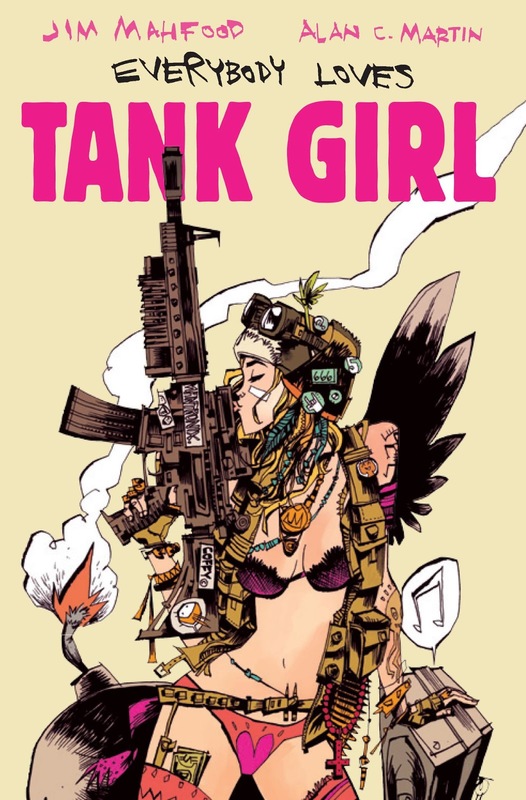 Everybody Love Tank Girl sees her return with original writer Alan C. Martin and a new illustrator in Jim Mahfood, whose previous roles have included Illustrating Director for Kevin Smith’s Clerks comic. This beautiful hardback goes back to her roots with a collection of short stripes, single page monologues and also a gallery of never-seen-before artwork from Jim Mahfood. One of the great things about Tank Girl is her constantly changing image, there is no ‘set’ look for her. She’s usually wheeling some sort of firearm or samurai sword but the fact her hair and clothes change from story to story is something I’ve always really loved and it’s great to see that carry on. Booga (Tank Girl’s mutant kangaroo boyfriend/sidekick) continues to be her right-hand man while being dense as ever and even Jet Girl pops up. I especially enjoyed the strip ‘Tank Girl 2’ that pokes fun at the infamous flop of a Tank Girl movie. I am sure lots of Tank Girl fans will be wondering if she holds together as a character now that Jamie Hewlett (the original artist) has moved on and the answer is yes, absolutely. Of course, there are differences in style but she’s still the lovable nutcase she’s always been and I had great fun immersing myself in her world again. Long live Tank Girl!